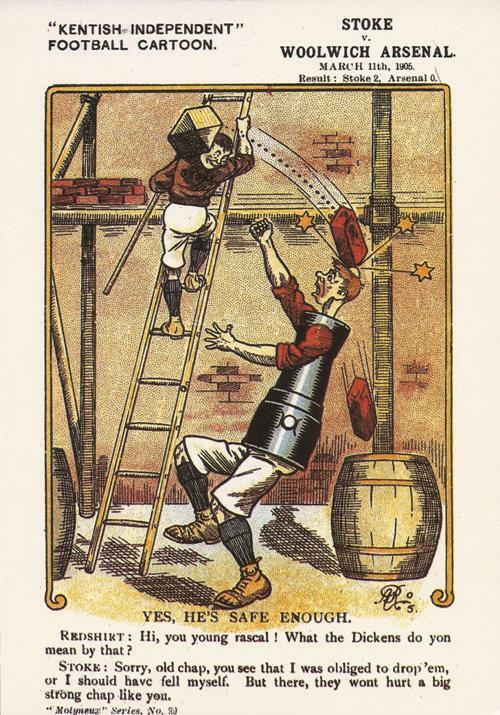 In the cartoon we find Stoke climbing up the ladder after the 2-0 win on 11 March 1905 at the expense of Woolwich Arsenal. The win was far more desperate for Stoke who were flirting with relegation, and did manage to remain in the top flight eventually finishing 12th, just 3 points and 2 places behind Woolwich Arsenal. The bricks being dropped, presumably, equate to the 2 points that Stoke gained with the win, and despite them dropping on Redshirts head, the comment of “He’s safe enough” shows that Arsenal had done enough in the season to not be too concerned over this loss. However the manner of the loss led to Woolwich Arsenal’s fiery Scottish manager, Phil Kelso, to become involved in an altercation with the Stoke Chairman. The gateman had put the Arsenal directors and manager in the Stoke directors’ section of the grandstand. So, as Stoke’s tactics for the game were aggressive and overtly physical, this led to some chirping between the sets of club officials. Stoke’s Chairman took it further and kept on calling for the continuation of their dirty play and, at this point, Kelso stood up and angrily remonstrated with him. A Policeman turned up but quickly left when he realised the altercation was between two high ranking club officials and not rowdies from the crowd as he originally believed. Later in his Arsenal managerial career Kelso fell foul of the Police in an FA Cup quarter-final tie away against Manchester United on 10 March 1906. 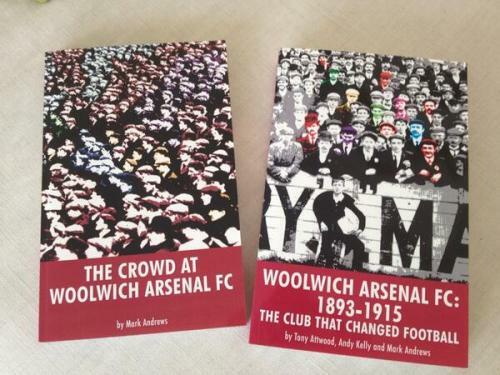 In a game that was won 3-2 allowing Woolwich Arsenal to proceed to their first semi-final appearance tensions were running high near the end. Kelso was shouting to the players telling them how long there was to go and he was accosted by a nearby policeman who threatened to arrest him. Phil Kelso left the club in 1908, but his temper remained strong at Fulham, and there are stories of him ejecting people from their ground. In particularly one in the early months of WW1, when a rabble rouser was trying to get men to enlist without asking permission to do so from the club. He along with another employee roughly manhandled a Mr Charrington from the ground and threw him on the street.